You are here: Home � All Deals , Featured , Home: Kitchen Grocery Furnishings � Get a Haier 6-bottle Red and White Wine Cellar for only $64.99 shipped to your door. Get a Haier 6-bottle Red and White Wine Cellar for only $64.99 shipped to your door. Buy.com is selling a Haier Wine Cellar for $64.99 shipped. 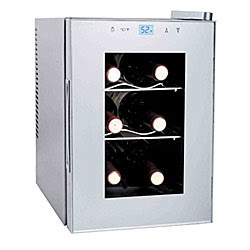 The cellar can store up to 6 bottles of wine, and its tempature settings make it capable of storing both reds and whites. This wine fridge is extremely quiet, and its 21.7 pound weight frees it from the rattling you might get if you bought a more cheaply made product. The temperature setting is controlled by a touchscreen system on the front of the cellar, and you can quickly raise or lower the temperature accordingly.